A Dolomites hiking adventure isn’t just about the trails, though they are certainly world class. It also brings you into contact with the intriguing heritage of the region, which sits at the crossroads of Italian, Austrian and Ladin cultures. As you trek from one panoramic, welcoming mountain refuge to another, you will encounter much more than mountaintops. An ancient pastoral tradition, delicious mountain cuisine and the local Ladin language are all part of the experience. 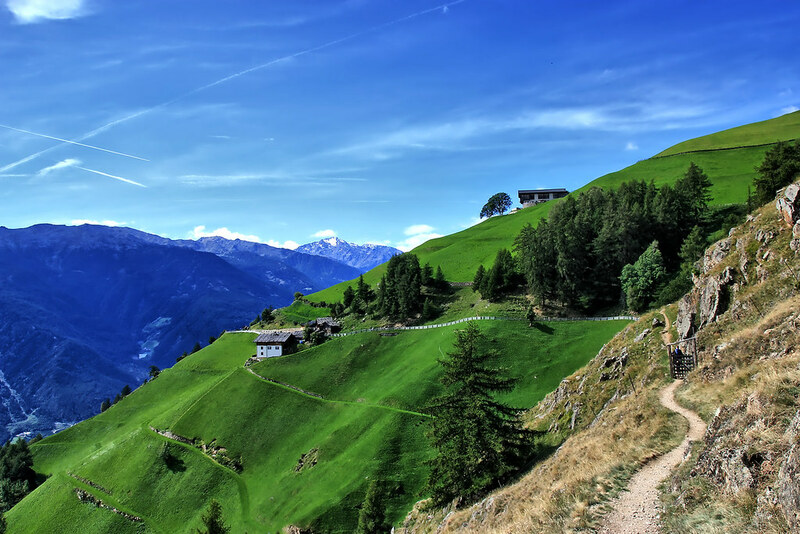 Whether you choose day hikes accessed by cable car, multi day loops through villages and pastures, or you prefer to hit the renowned ‘Alta Via’ trails that bring you right up into the peaks, there’s no shortage of routes for the keen trekker. And no guide to the Dolomites would be complete without flagging up the extreme beauty of the landscapes all over the region. If you are looking for scenic, you’ve found it. Known by locals as the Queen of the Dolomites, the Marmolada is the highest peak of the region, reaching the dizzy heights of 3343 metres. It straddles the regional border between Trentino and Veneto, around 100 kilometres north of Venice. The Marmolada is in fact a ridge with a series of summits dropping in altitude from west to east. Punta Penia is the highest at 3343 metres, followed by Punta Rocca rising to 3309 metres, Punta Ombretta at 3230 metres, next is Monte Serauta’s 3069 metre peak and finally Pizzo Serauta which stands at 3035 metres. 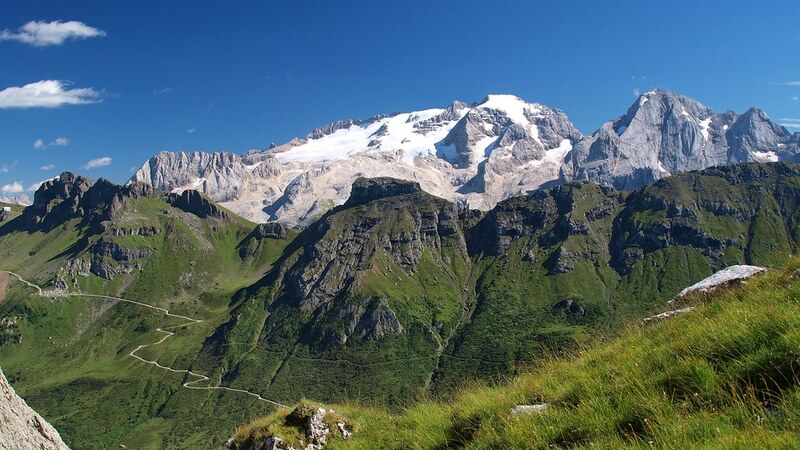 Monte Marmolada supports a glacier at its most northerly sector, and glacier hikes are possible from June to September for fit participants with the correct equipment. This summit was sliced through by the national border between Italy and Austria before World War 1, and was the scene of conflict during the fighting. When the glacier recedes there are often war relics and even bodies of soldiers uncovered amid the melting ice. There are several locations to base yourself in the Dolomites, each with its own unique appeal and adventure options. 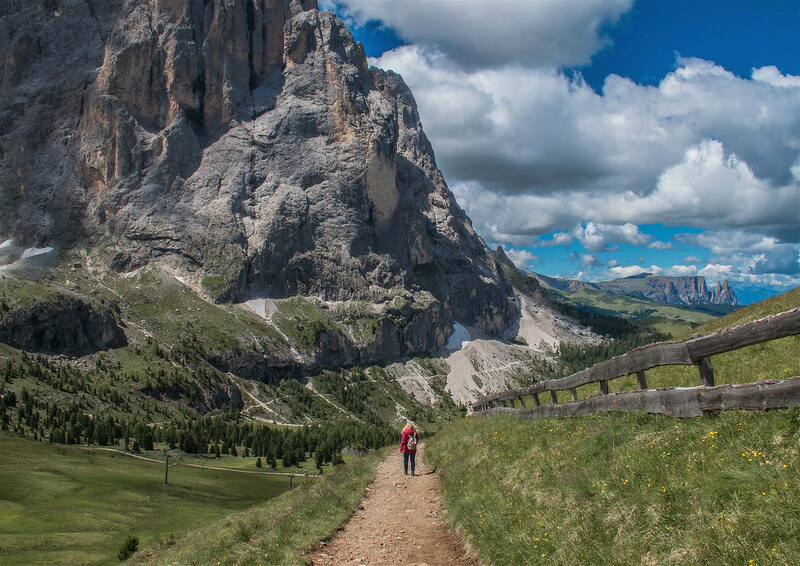 For access to the Val Gardena trekking routes and the heavenly Alpe di Siusi, choose one of the towns in the valley, Selva, Santa Cristina or Ortisei. For the best access to the Marmolada ridge, Canazei is a good base. 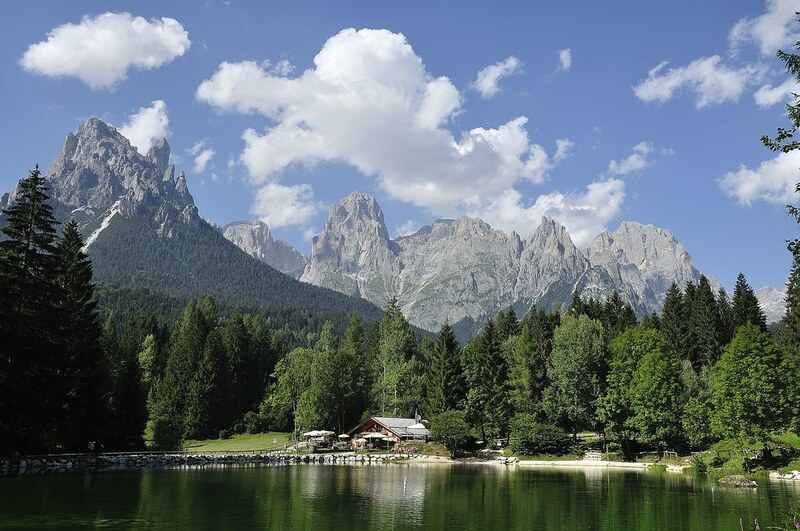 Cortina D’Ampezzo is a chichi town with excellent hiking infrastructure, plenty of nightlife and exclusive shopping. It’s a place to see and be seen but it’s also a fun place for a night out after a hard trek. Bolzano is one of the major towns in the Dolomites region, and has lots of cultural sights worth making time for. It’s one of the best towns to see local life as tourism is not its only industry. Belluno is the major town in the eastern Dolomites and offers lots to do in the immediate vicinity. It is also the end point of the Alta Via #1 and has loads of accommodation options for that post trek downtime. Brixen (Bressanone in Italian) is a historic town not far from the Austrian border where the Tyrolean architecture and surroundings can make you forget you’re in Italy. Eight varied multiday routes known as ‘Alte Vie’ wind through the highest ranges of the whole Dolomites region, linking some of the world’s best mountain refuges along spectacular trails. Tackle an entire route over a couple of weeks, or pick one of the shorter stretches, where accessible. One of the most celebrated routes is the Alta Via #1, which traverses the eastern reaches of the region. It covers 125km in around ten panoramic stages, beginning at the crystalline Lago di Braies and heading south to Belluno. In common with all the High Routes, the trails are well maintained and clearly waymarked with fantastic overnight facilities for hikers. These eight treks are a great way to spend a few days at altitude – often around 3000 metres – walking right up among the soaring granite spires of these iconic mountain ranges, enjoying some of the most jaw dropping landscapes on the planet. For much of their extent, these trails are relatively straightforward, but there are certain stages which are more demanding, some requiring via ferrata equipment and scrambling, and all requiring a good level of fitness, some experience at altitude and a head for heights. One of the most scenic and celebrated valleys in the Dolomites is best known for its attractive towns and surrounding landscapes. There is easy access to spectacular hiking routes made all the quicker by several lifts operating throughout the summer as well as during the ski season. Accessed directly from the Val Gardena is the largest alpine plateau in Europe, the Alpe di Siusi, a truly stunning expanse of undulating pastures fringed by some of the most imposing peaks in the whole Dolomite region. There are all sorts of trails in and around the valley and the plateau, some are easy day hikes such as the Sentiero del Pastore, the Shepherds path, which takes in a scenic loop around the base of Sasso Piatto peak. There are a number of mountain refuges in the vicinity, all with awesome views and excellent food for that hearty mountain lunch among the meadows. Longer, more demanding routes include the Gardena 2000, a high level route entirely above 2000 metres which takes six days to complete a loop around the entire Val Gardena, overnighting at refuges and tackling the famous ‘Sella’ of the Sella Ronda. This is a challenging trek and a good level of training is required. Until the terrible events of the First World War, much of the Dolomites range was not part of Italy, and even though it’s around 100 years since the region was brought under Italian rule, there are lots of corners which still feel decidedly non Italian. Some corners still have a strong Tyrollean identity, which you can spot in the architecture, food, and dominant language. 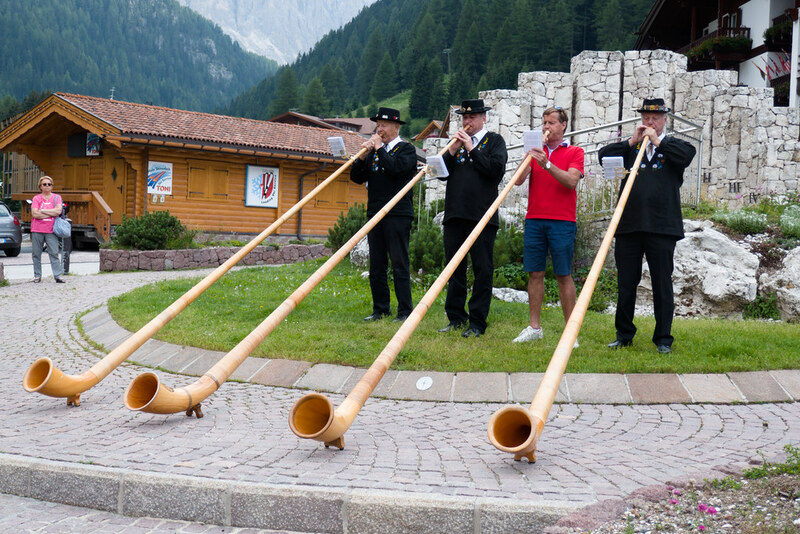 The most significant pockets of Ladin speakers remain in the Val di Fassa (where there is a museum of Ladin heritage), Val di Non, Val Gardena and Alta Badia, and for many inhabitants across the Trentino and South Tyrol regions dialect is spoken at home, German is the lingua franca and Italian is only used when necessary. Traditionally these mountains have a strong pastoral heritage, and much of the population were engaged in agriculture before tourism became such a major part of the economy. Today, the intermingling of cultures is one of the many alluring aspects of visiting the region, and if you are lucky enough to stumble upon a local festival while you are there, make the most of the opportunity to see the colourful traditions in action. Explore our hiking in Italy trips and other Italian adventures.